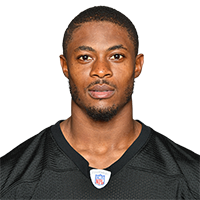 Published: Dec. 25, 2017 at 07:43 p.m.
Pittsburgh Steelers cornerback Artie Burns picks off Houston Texans quarterback T.J. Yates on fourth down in red zone for a touchback. Published: Oct. 29, 2017 at 11:31 p.m.
Detroit Lions wide receiver Golden Tate fumbles pass from quarterback Matthew Stafford, Pittsburgh Steelers Artie Burns recovers the fumble. Published: Jan. 15, 2017 at 09:48 p.m.
Kansas City Chiefs running back Charcandrick West fumbles football, Pittsburgh Steelers cornerback Artie Burns recovers.